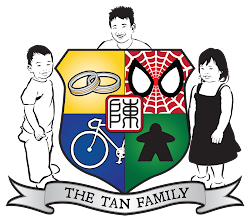 Tan Family Chronicles: Make-Your-Own-Car today! I'd always loved playing with toy cars, ever since I was very young. I still have my collection of Matchbox cars and Tamiya cars which I have not even let Isaac peek at. I also enjoyed crafting and making stuff. So when a certain crafty mom Alicia Tan suggested a Crafty Linky Party - I knew I wanted to make a vehicle of some sort. I initially wanted to do boats, but I thought it'd be more fun to do cars instead. And I was right! 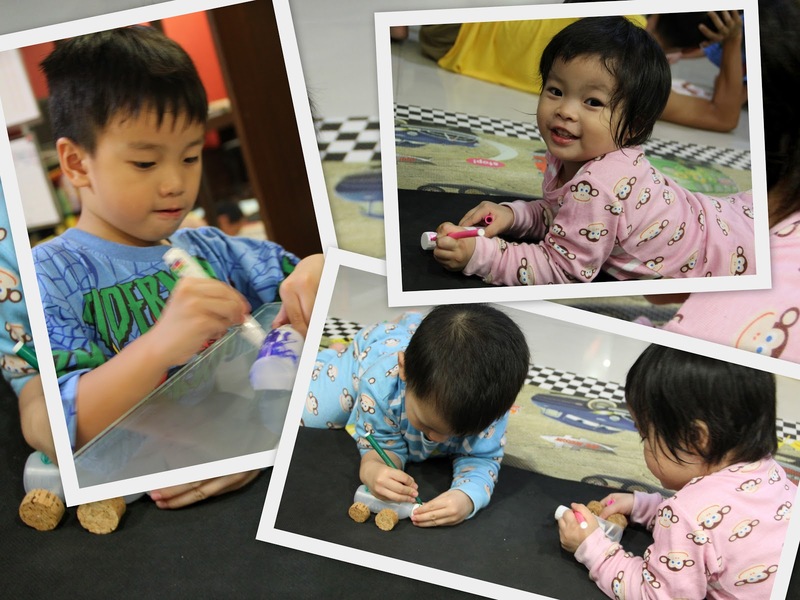 The kids enjoyed playing with the cars very much. .
Make your own Medicine Bottle car! That's it. Very economical, ain't it? :p Of course, other tools you would need include the penknife and a large safety pin (see picture above) which I used to poke a hole in the cork first so that it'd be easier for the toothpick to go in later - if you skip this step, the toothpick may keep breaking and/or not enter the cork in the angle you want (which is like perpendicular to the surface - straight in). I also made a cork-tired car with a Yakult bottle. 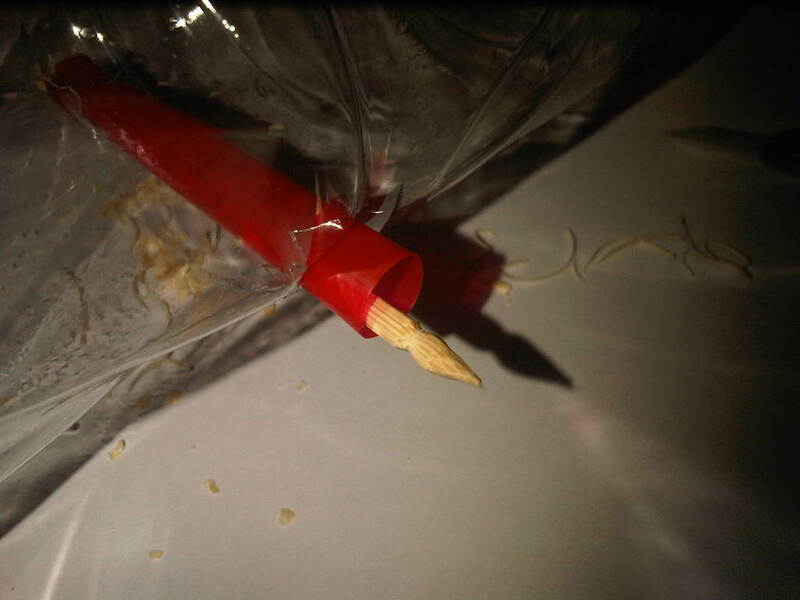 But as the width of the Yakult bottle was wider than that of the medicine bottle, I had to use satay stick and a regular sized straw for the axels instead of a toothpick and yakult straw. 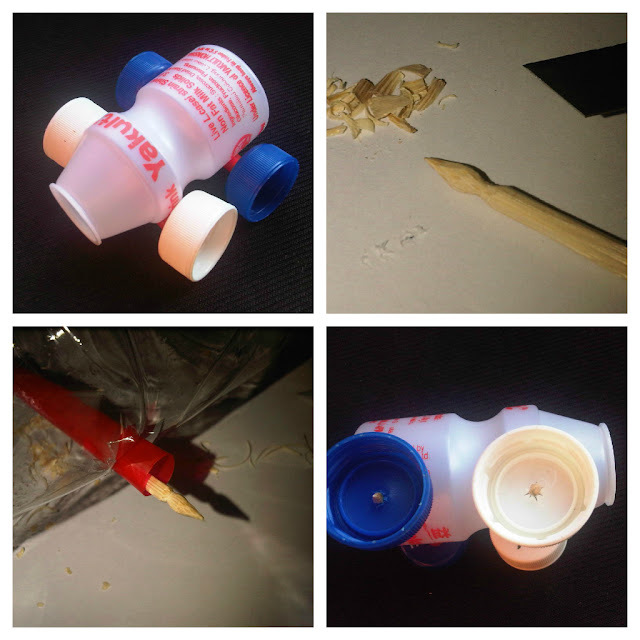 It actually ran smoother than the medicine bottle car coz the regular straw was much wider than aYakult straw, and gave more room for the satay stick axel to turn. 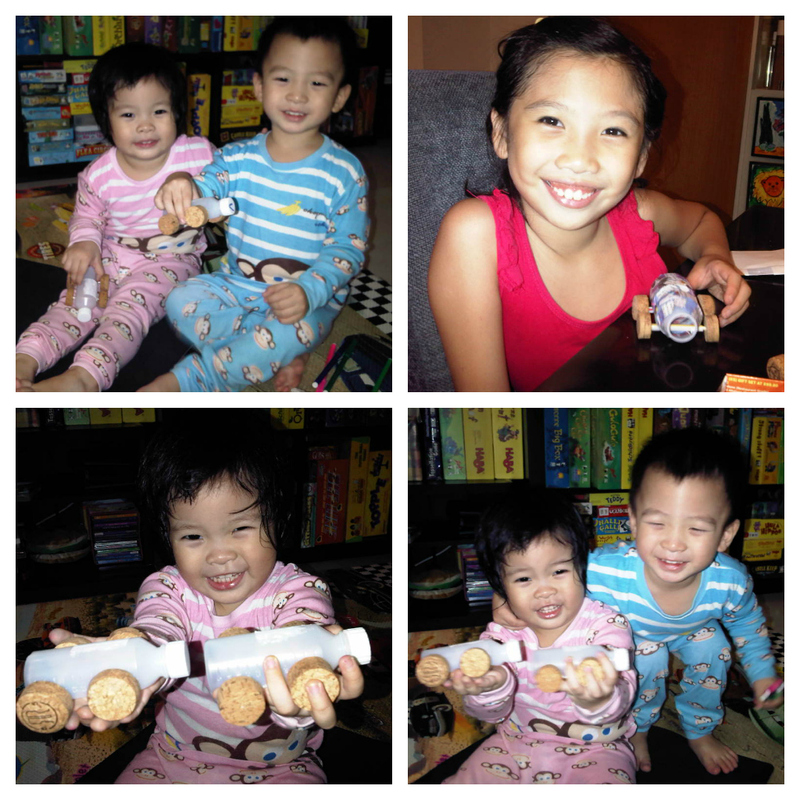 The car that Rebecca's holding in the top right hand corner of the top picture, is a yakult bottle car. I loved the way they look, with the cork tires and medicine bottle chassis, very Muji look, I thought. But perhaps they'd look nice with some colour as well. So it was time to decorate it! Initially, I tried letting the kids colour the cars' body with permanent markers (results as seen in the video). Here are the kids colouring the cars with permanent markers. But by the next day, the cars were still kinda sticky from the marker ink! So, I decided that we had to "colour them" another way. 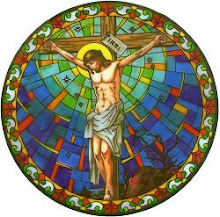 You could paint it, I suppose. But I didn't want pain flaking off the kids' hands when they played with the cars, so I went with pasting magazine paper over and white glue. Plus this is a nice and safe activity which the kids could get involved in - and there was no danger of permanent ink going on where it shouldn't be. Yes, I was a bit perfectionist and did the first two on the bottom row. Shawna helped squeeze the glue for me, though. And I'm really proud of Asher for pasting all the green facing up! Green's his favourite colour! 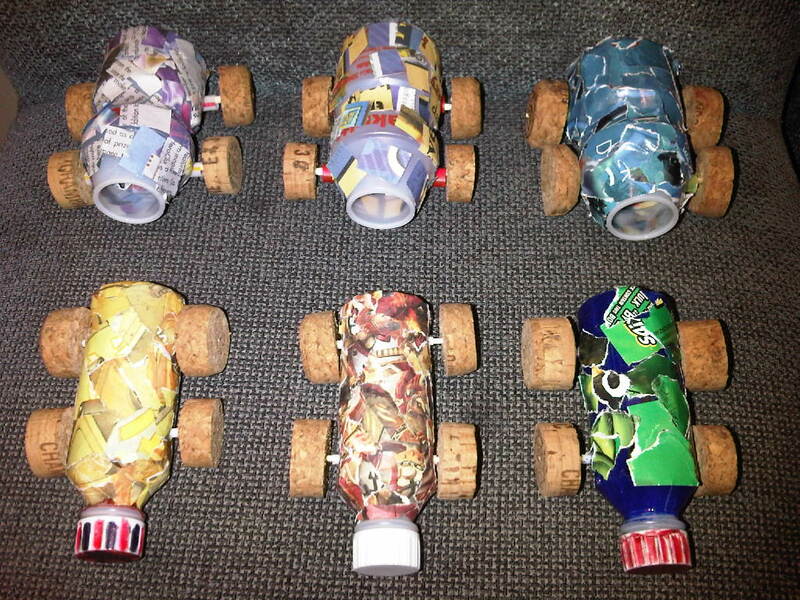 The only problem with these cork-tire cars, was that, kids being kids, were kinda rough when playing with the cars - and the wheels would drop off. Also... friends were commenting that it wasn't easy to find corks (seems like nobody is crazy like me and collected the corks from my wedding reception - er, like 7 years ago). So... I had a brainwave! Use bottle caps! Surely that'd be easy enough to collect! I would recommend using a normal straw and a satay stick as opposed to a yakult straw and toothpick. The above shows a close up of the axel. Don't forget the straw - it's very vital for the smooth-running of your vehicle. Your straw just needs to be a little longer than the width of the bottle that you're using as the chassis. And the stick just needs to be a little longer than the straw is - remember to leave an allowance on both ends. So, push in your wheels and you're done! I was very pleased with this version of the vehicles coz it kept the wheels/tires on very tightly. Shawna tried to pull them out and she couldn't! 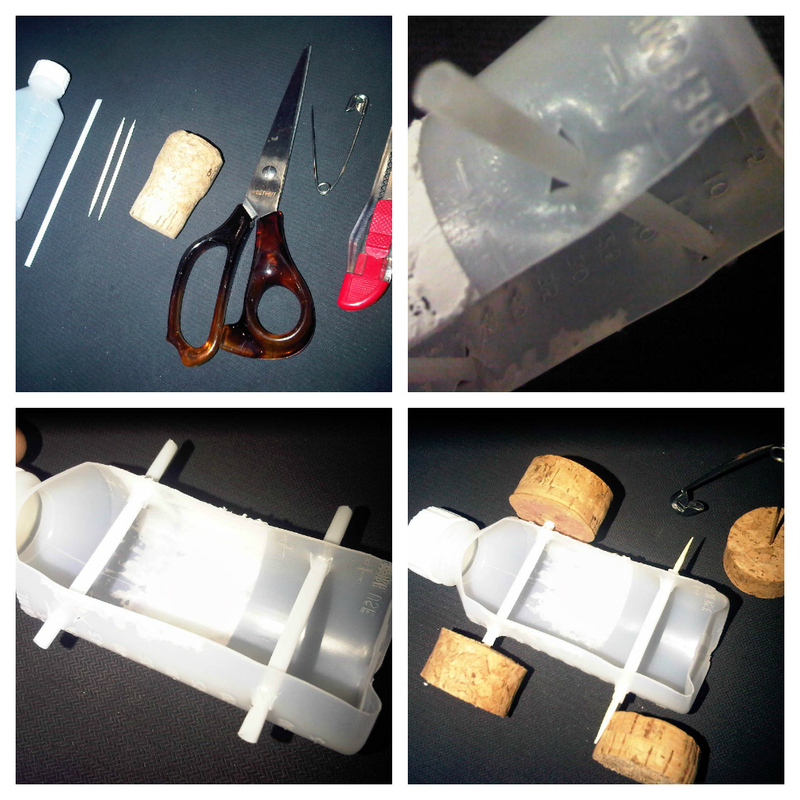 Subsequently, I made a vehicle the same way with a 500ml bottle, at first with cork tires. But Isaac liked the bottle cap tires so much he requested to have the tires changed. Watch the two videos below of Shawna and Isaac playing with the bus - oh yes, we called it the bus because it was more than twice the length of the cars. 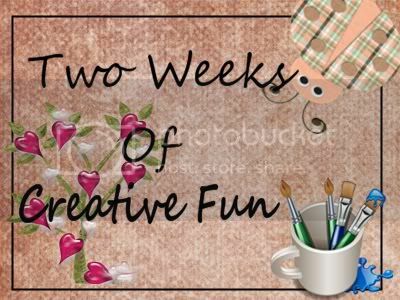 This post is part of the "Two Weeks of Creative Fun" series mooted by the brilliant Alicia Tan, An Accidental Homeschooling Mum - so there is more creative goodness out there for you! Ain't that simply faboo! 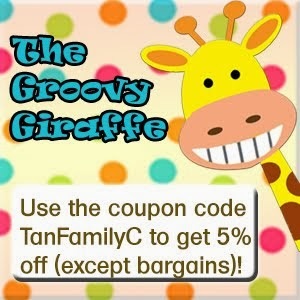 :) Just go to the links below! June 23 - Sandra - Dinosaur galore! June 25 - Susan - Finger puppets: We're building a farm! June 29 - Regina - sMOOp Dogg! July 2 - Pamela - Make-Your-Own-Car today! - That's us!!! As you can see from the above schedule, next up is Ming Yuan! She is a mom who is always on the lookout for exciting adventures and interesting activities to engage her super-active 3 year-old. She blogs about their lives together to capture their memories, so that years down the road when when her girl grows up not remembering how she spent her childhood, she will know. And so that days, months or years down the road when people ask Ming Yuan about what they do together, they will have their blog to share. Wah!!! I didn't get a chance to see your Crafty post till now... and SOLID la. Still got videos!? Love the final product! Haha thanks Sandra, you guys can try it too! I'm sure Jay would love it kekeke... boys and cars!?!? Super cool! This is a really creative use of scraps! Hehehe thanks Sarah! :) I love the challenge of recycling materials into something fun or useful. Very fun cars you've got Pamela! What great fun for the whole family too :) And yes I still cant believe you're so karang guni to keep your wine corks from your wedding! hehehehe... I totally have a hoarding OCD, I'm telling you. Trying to dejunk and not keep so much stuff nowadays though. 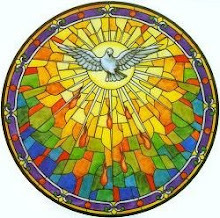 Otherwise, no end! you know what? you are my lifesaver! i've been wanting to make cars for poppy for the longest time but my non engineering brain just can't figure out how to make the wheels work! thank you, THANK YOU!!!! I'm trying to get an alternative for Yakult bottles because you can't get them here. Lol. This is really a fun project to try out, thanks for linking up and sharing!